John Posson is a P-51 Mustang and L-39 instructor at UAT. 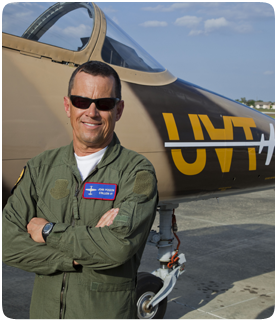 John brings an array of aviation experience to UAT, including over a decade of flying the L-39 with The Patriot Jet team at air shows around the country. But John’s valuable experience flying the L-39 is only part of his more than 19,000 hours of flight time. He also has 24 years of airline experience, including United Airlines, Hawaiian Airlines and Wein Air Alaska. John’s experience with vintage aircraft is just as impressive. He flies everything from Cubs to Mustangs, DC-3s and Beach 18s, Howards to Norsemans to Grumman Widgeons. He has also flown in the wilds of Alaska as a professional bush pilot. John loves all things aviation. He has over 100 hours of hand-gliding time and over 2,600 parachute jumps. He has also participated in competition aerobatics through the unlimited category. John is a strong supporter of sport and general aviation, and he owns a Bonanza, a Super Cub and a Cessna 180. John is originally from Arcadia, California, and graduated from San Diego State University with a degree in business.